Learn Lenny Laskowski's Six Keys to Successful Team Presentations, his guide to planning the team presentation and his Seven Keys for Organizing team presentations. Everything you need from beginning to end. Over the past two This item is available in downloadable format only. Since it isn't shipped, be sure before you order that your shipping charges are 0.months, you and your team have put together a presentation for an important client for next Tuesday. Today you held your first "dry run," and you found numerous problems — most of them fixable. But two problems involve visual aids, and one involves a sharp disagreement with the account manager about what you can promise and what you can't. You're pretty sure that you can't get the visual aids fixed by Tuesday, and things are now pretty sour on the team. How did you get here? Why didn't you find out about these problems before now? And how can you avoid these problems in the future? Most team presentations run into glitches — that's perfectly normal, with anything even half as complex as a team presentation. What's sad is that most of the glitches that trip up even high-performance teams are so predictable. The troubles tend to arise from inadequate planning and testing, and they're easy to prevent — once you know what Lenny Laskowski knows. Team presentations are a People who ordered this item also ordered Audio/Visual Aids: Advantages and Disadvantages and Terrific Technical Presentations .bit different from other kinds of presentations — they usually have a lot more riding on them. So, to all the stress of standing up in front of a crowd, add the intense pressure of a high-stakes adventure, and — usually — not enough time to prepare for it. In "How to Prepare and Deliver a Great Team Presentation," you'll learn Lenny Laskowski's Six Keys to Successful Team Presentations, which alone probably make this read worth while. But when you add to that his guide to planning the team presentation and his Seven Keys for Organizing team presentations, this power-packed booklet is an absolute must. You'll also learn how to manage your supporting materials, and his Eight Steps to Staging and Delivering a team presentation. Everything you need from beginning to end. 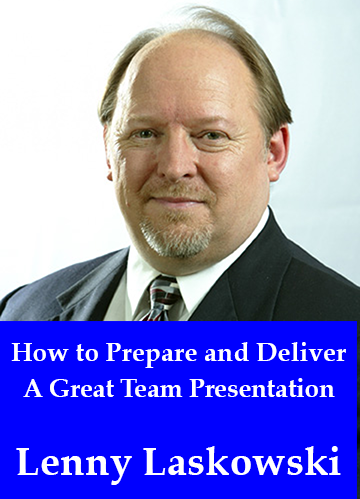 How to Prepare and Deliver a Great Team Presentation is in Acrobat format, which gives you several advantages. You can print it, and read it like any book. Or in electronic form, you can use the search capability of Adobe Reader to find passages of special interest to you. If you load it onto your laptop, tablet, or other mobile device, you can read it anywhere — and it's weightless, too. Lenny Laskowski is an international professional speaker, author, consultant, seminar leader, and professional speech coach and one of the leading international experts in presentation skills, public speaking and communication skills. Lenny shares his presentation skills and public speaking expertise with audiences worldwide and offers more than 28 years experience as a seasoned presenter and speaker. I'm honored to consider Lenny a colleague, and I'm pleased to be able to offer //www.ChacoCanyon.comTi to visitors of my Web site.